Lodging in and near White Salmon is already filling up! TUESDAY NIGHTS — Meditation/Talk with monks, 6:30 – 8:00 pm, Yoga Samadhi. All welcome. Cushions & chairs available. No charge. Come for any or all of the party! 10:30 am — Arrive for potluck meal. Coming? Please let meal dana coordinator know. 11:00 am — Meal, cleanup and preparation for yard work. MAY 13 — Half-Day Retreat in White Salmon, 1- 5 pm, at Yoga Samadhi. 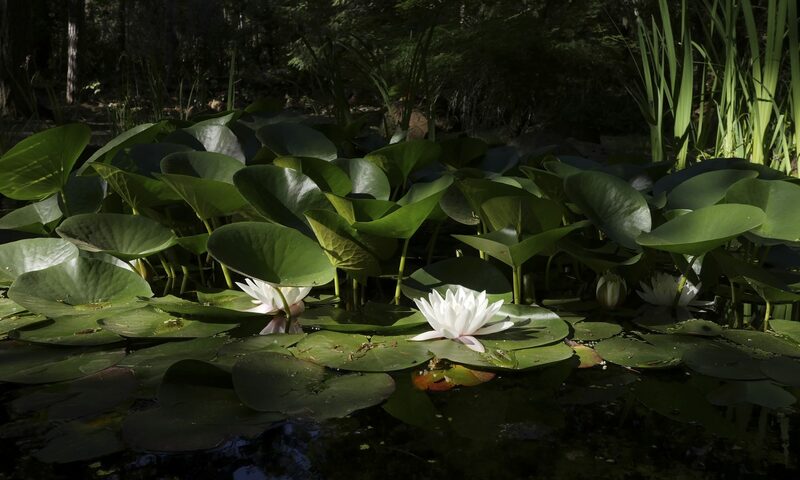 Enjoy sitting and walking meditation with the monks, and Dhamma reflections by Ajahn Karunadhammo. No charge. All are welcome. Cushions & chairs available. MAY 19 & 20 — PFoD visit CANCELLED because there will be no Ajahns in residence. Ajahn Karunadhammo (pictured) and Tan Khantiko will return to the Hermitage and be there while both Ajahn Sudanto and Tan Kondañño are away. MAY 2 – 14 — Ajahn Karunadhammo will help hold down the fort for a couple of weeks. We welcome this gifted teacher, even if his stay is far too brief! He and Tan Khantiko will arrive with Ajahn Sudanto after the meal on May 2. MAY 2 – JUNE 3 — Tan Khantiko also has spent time at the Hermitage. Welcome back! Pacific Hermitage monks follow the Buddha’s tradition of relying on the lay community for their meal every day. Monks are not allowed to grow, buy or prepare food. It’s sobering to realize that if no one offers them food in the morning, the monks won’t have a meal that day. Offering “meal dana” is a heart-opening, joyful experience. Ask anyone who has done it! 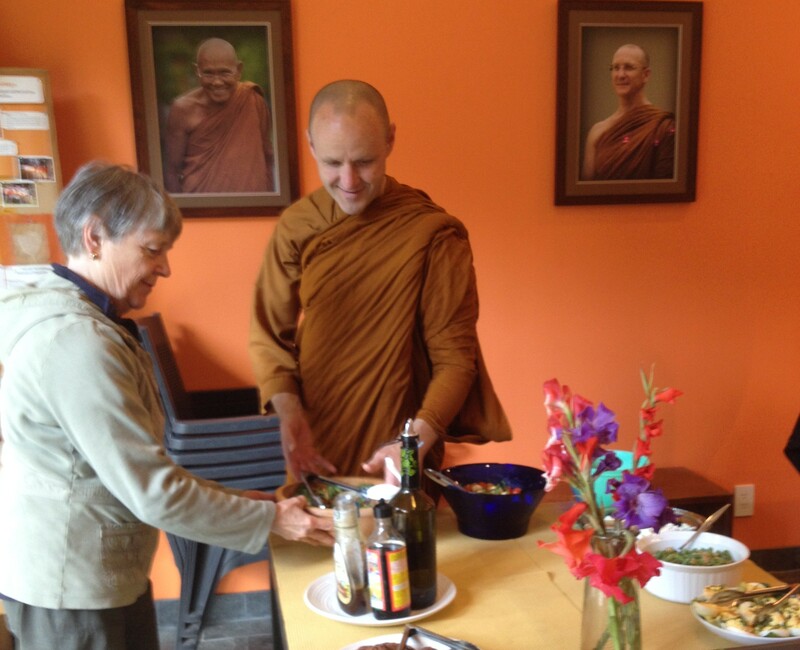 Not only is it a way to get to know the monks and ask them questions one-on-one, it is a direct and traditional Buddhist way of practicing generosity. 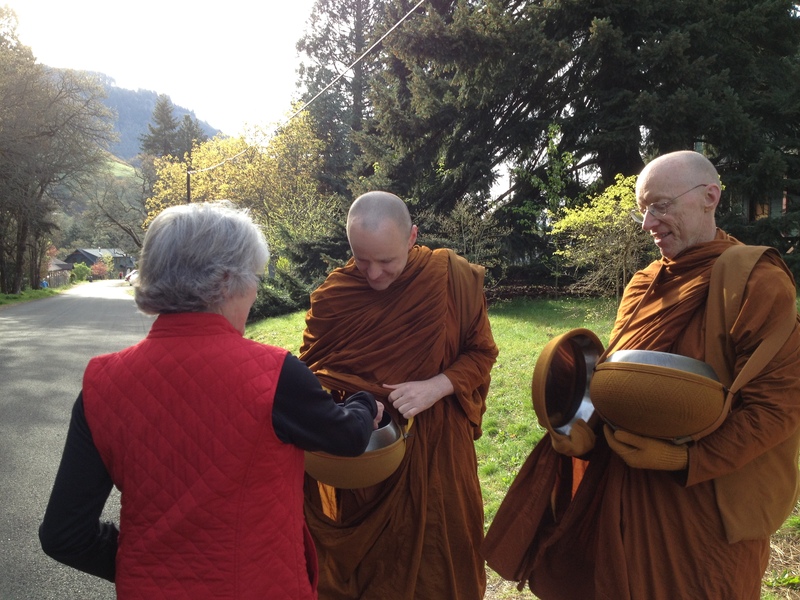 Offer food to the monks as they walk alms rounds in White Salmon (mostly needed on weekdays). More information — Check Support on the website or contact me (Debie), meal dana coordinator. Feel free to just ask questions. There’s no obligation. Or talk with someone else who has offered food. If you’re a little nervous, I understand. I certainly was my first time! To offer a meal at the Hermitage — Please check the Calendar to find out when meals are needed, then contact the meal dana coordinator to schedule your offering. *A Pah Bah is a traditional Thai ceremony for giving robe cloth and other necessary items to monastics. For more information or to volunteer, email pahbah@sanghata.net or check the Sanghata website: sanghata.net. Sanghata is the Board of Stewards for the Pacific Hermitage. 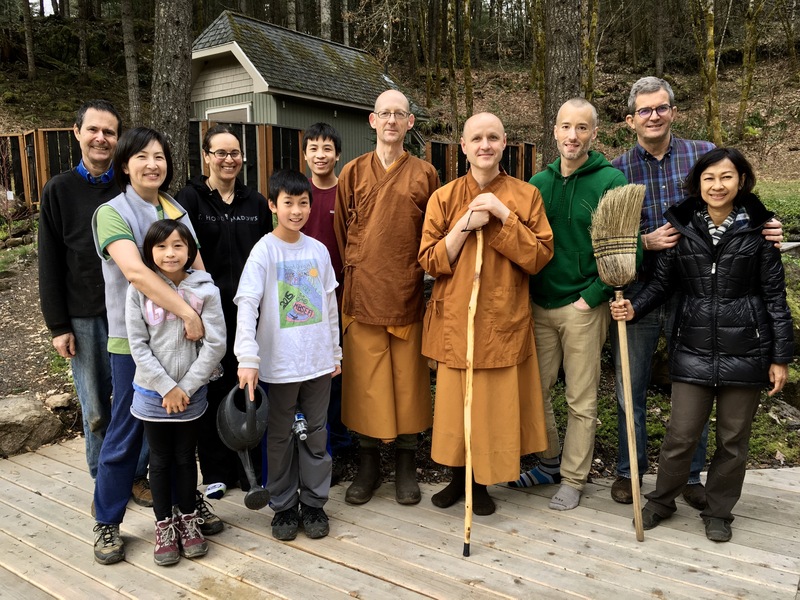 **Birken Retreat — Lay community members join Ajahn Sudanto and Tan Kondañño for a retreat at Birken Forest Monastery (Canada), May 3 – 13. All spaces are full.